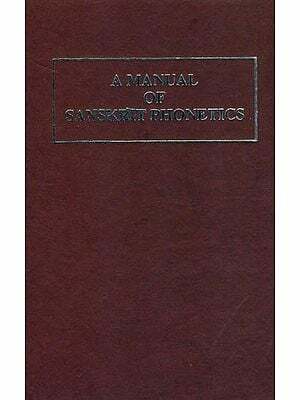 The Present work titled, "classical Sanskrit Literature: is grouped in ten Chapters, starting with classical Sanskrit and ending with the theories of poetry. In between the author makes an effort to deal with the predecessors of Kalidasa, Kalidasa the post-Kalidasa epic, the historical Kavyas, the prose romance and the champu, the popular tale, the diadactic fable and the lyric and gnomic verse. 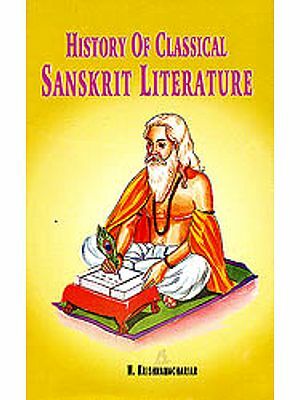 The present work titled 'Classical Sanskrit Literature" is grouped into ten chapters starting with Classical Sanskrit and ending with the theories of poetry. In between the author makes an effort to deal with the predecessors of Kalidasa, Kalidasa, the post-Kalidasa epic, the historical Kavyas, the prose romance and the Champu, the popular tale, the didactic fable and the lyric and gnomic verse. 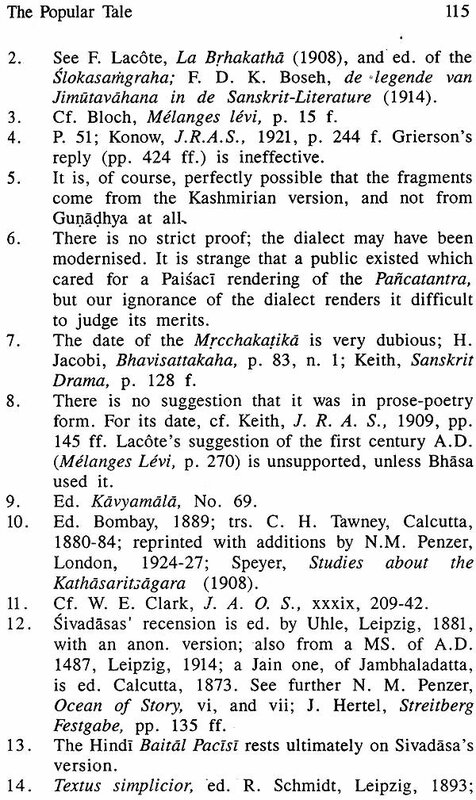 The first chapter deals with classical literature in Sanskrit. 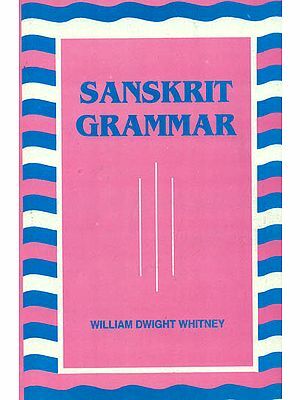 The author discovers that Sanskrit was essentially in the form in which it was regulated by the grammar of Panini, in the fourth century B.C., a form of speech reserved for those who conducted sacrifices and engaged in theological speculation, in effect for the Brahmins. India was subject to invasion from the north-west and west and to considerable movements of population, which must have excited rapid changes of speech forms in the areas affected, and driven poets and others, desirous of producing works to endure. The Ramayana of Valmiki and the Mahabharata of Vedvyas are said to be the foremost in Indian Kavyas. The second chapter focuses on the predecessors of Kalidasa wherein the author writes that classical Sanskrit has its roots in the epic, and that the incidental hints in Patanjali, are sufficient to show that the Kavya was already practiced in his day. The third chapter evaluates the works of Kalidasa including those of the Abhijnana Shakuntalam, Meghadutam, Raghuvamsham, Kumarasambhavam etc. The fourth chapter is on the post-Kalidasa epic. 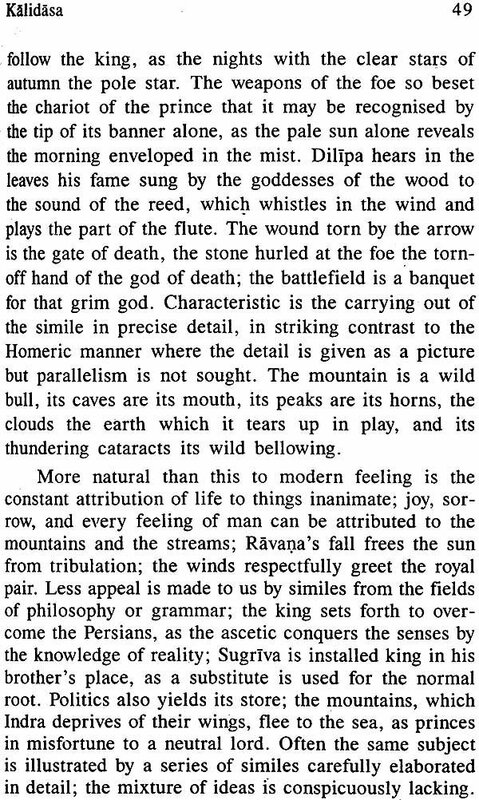 In the post-Kalidasa epic, the. 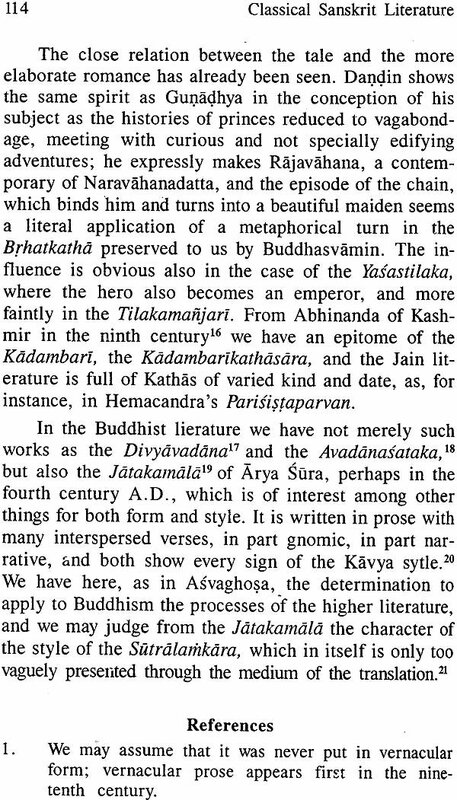 Kiratarjuniyam of Bharavi, the Shishupalavadham from the Mahabharata and Janakiharana by Kumaradasa etc. are the work that the present has evaluated. The sixth chapter is on the 'Prose Romance and the Champu where the author critically examines that Indian works and find none up to the mark. The seventh chapter of the book on 'The Popular Tale show comparison of Indian story writing with those of English where the present author again points out the lacunae in Indian writing He says: 'In the romance, such as the Kadambari, we have see. The application of the Kavya manner to the popular and relatively simple tale. The eighth chapter deals with the 'didactic fable". He say that the didactic fable should form at an early date a normal feature of village life, and that it should be reflected in literature as the Indians loved nature. The Rigveda and the Chandogya Upanishad and the Panchatantra are the works the present author picks up to have didactic fable. The ninth chapter is on 'Lyric and Gnomic Verse' . The author of the book says that Kalidasa's work evoked many lyrics, but nothing ever emerged to rival successfully the Meghaduta. The Harshacharita of Ban a Bhatta, the Three Shatakas of Bhartrihari and the Gitagovinda of Jayadeva are some of the works the author points out here. The tenth chapter of the book deals with 'Theories of Poetry'. 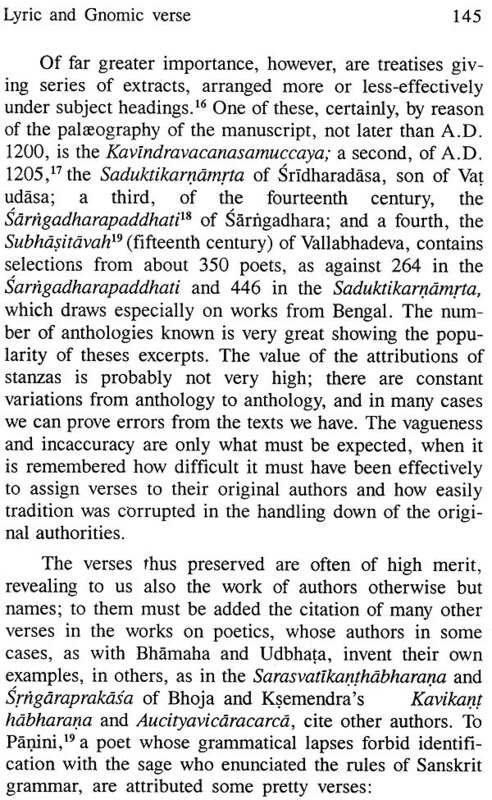 The oldest text which deals with the theories of poetry is the Natyashastra of Bharata. It is not concerned with a general theory of poetics, but with the drama. 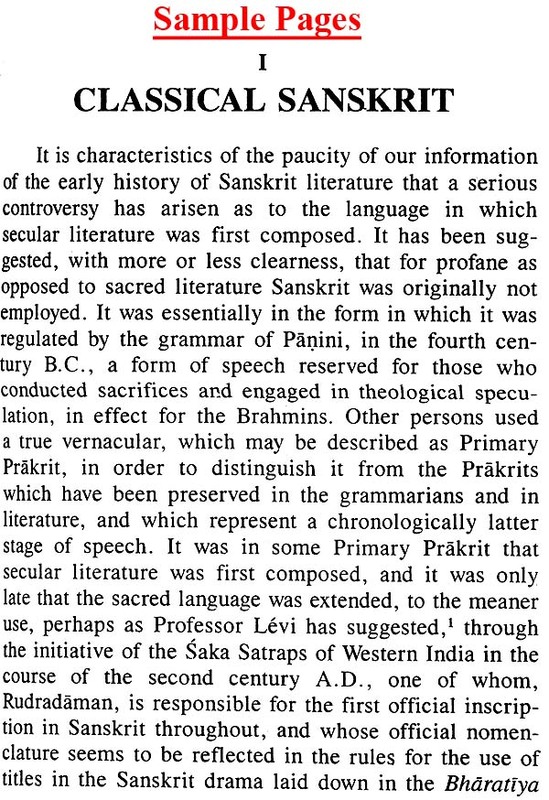 Sanskrit was essentially in the form in which it was regulated by the grammar of Panini. in the fourth century B.C, a form of speech reserved for those who conducted sacrifices and engaged in theological speculation, in effect for the Brahmins. During the Period before and after the Christian era India was subject to u invasion from the north-west and west and to considerable movements of population, which must have excited rapid changes of speech forms in the areas affected, and driven poets and others, desirous of producing works to endure, so. seek a medium more satisfactory than a vemacular in process of this change. 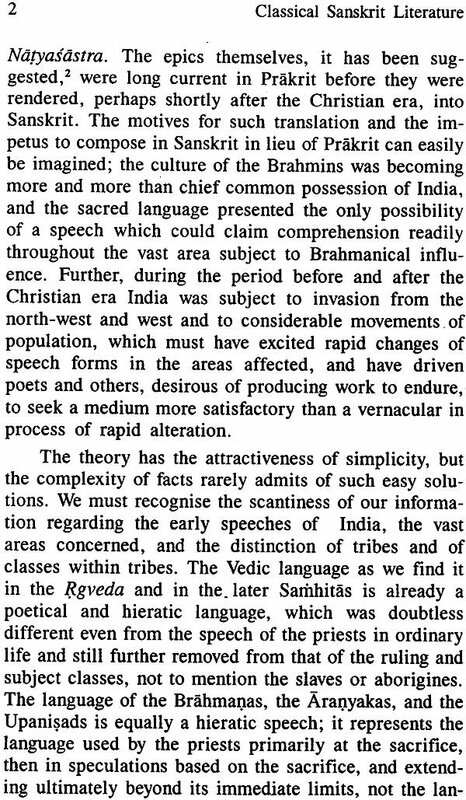 The Vedic language as we find it in the Rigveda and in the later Samhitas is already a poetical and hieratic language, and the language of Brahmanas and Upanishads is equally a hieratic speech. In the Grammar of Panini we find the norm laid down for the spoken language, Bhasa, of his time in the higher circles of society. Buddha or Mahavira, the founder or renovator of Jainism, in the fifth century B.C. used form of Prakrit, possibly the precursor of Ardha-Magadhi and those were rival religions to Brahmanism. In the inscriptions of Ashoka in the second half of the third century B.C., we find Prakrit and not Sanskrit. According to the writer of his book, we have a monument in the Ramayana and v1ahabharata, neither of which is in any sense a product of, though loved by, the populace. 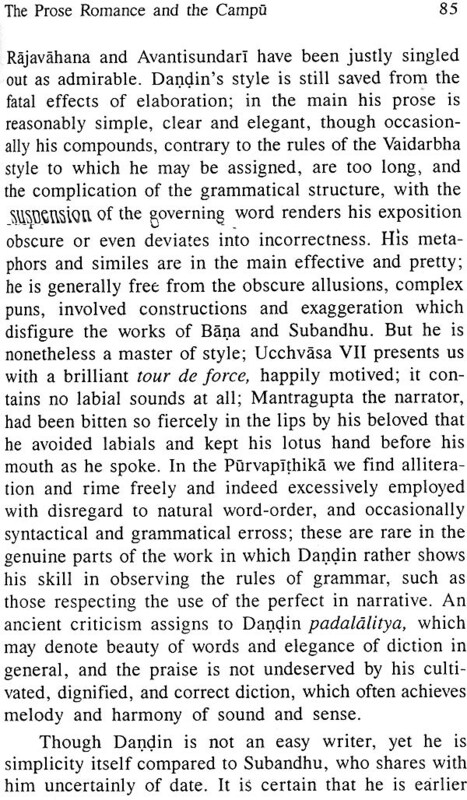 Apart from the question of language, there is now abundant evidence to show that the epic existed in some form in Sanskrit before Panini. .and the idea of translation about Christian era is wholly untenable. But, if the epics were composed in Sanskrit, the originality of the classical literature is assured, far from the epic a direct development leads to the Kavya. which is the highest form of classical literature apart from the drama. There is a very real sense in which the Ramayana can be said to be the first Kavya; though it has been embellished in the course of redaction, it is impossible to deny to Valmiki the command of a literary art which rendered the tendency to embellish a natural complement of his work. The elegance of Valmiki's handling of metre and his skilled use of figures of speech are precursors of the daintiness and polish of Kalidasa. Sanskrit had the enormous advantage that it had a real life in the Brahmanical schools and was always in some measure employed among the upper classes in conversation, while many who could not venture to speak it understood it adequately, it was in pre-Muhammadan times essentially the language of culture. 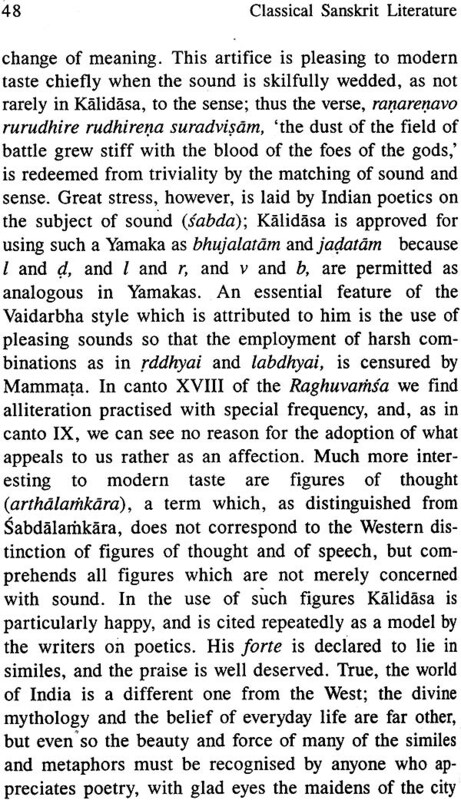 When going to study on the predecessors of Kalidasa as being the second chapter of the book, the author writes that classical Sanskrit has its roots in the epic, and that the incidental hints in Patanjali, are sufficient to show that the Kavya was already practiced in his day. As for Kalidasa (as goes the third chapter), it is to his dramas, above all to the Abhijnana Shakuntalam, the finest work in classical Sanskrit literature that Kalidasa owes his greatest renown, but in the lyric and epic also he takes the first place among Indian poets. Raghuvansha is Kalidasa's masterpiece, the last and greatest of his Kavyas. The Meghaduta is doubtless the best known of Kalidasa's works after the Shakuntalam. 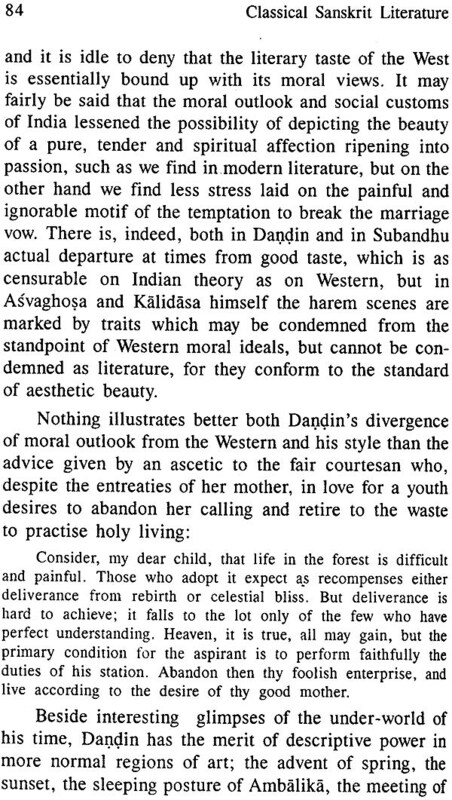 Here in Kalidasa seems to owe some measure of inspiration to Valmiki: the longing of Rama for the lost Sita. The Kumarsambhavam is another great work. In Post-Kalidasa epic, tradition would have contemporaneous with Kalidasa, the Setubandha, a poem in Maharashtri which elicits praise from Dandin and Bana. Before Bana also we may place the date of Bharavi. Certainly later than Kalidasa, Bharavi displays gifts of no mean order. The subject of his Kiratarjuniyam is derived from the Vanaparvan of the Mahabharata which tells us how the sage Vyasa advised Pandavas to leave the Dvaita forest and how Arjuna practices penance and after a conflict with Shiva under the guise of Kirata obtains from his conqueror the weapons he desires. Yet another Rama epic is the Janakiharana of Kumaradasa. The Shishupalavadha is based on an episode in the Mahabharata. As for the historical Kavya, there is none that can be called historical, but the material is presented by the Kavya, inscriptions, which normally refers to some definite event, and sometimes given genealogical details of alleged descent. Kalidasa, as we have seen refers to hint at the greatness of the Gupta in the Raghuvansham rather than describe their deeds as sober history, and it may be true, that the Setubandha was written to celebrate the building a bridge of boats across the Vitasta by king Pravarasena of Kashmir . It is a natural form of historical composition. As the Indian history as been falsely understood by most of the foreign writers, this writer has also concluded in the same fashion of writing about Indian style of living and they have certainly failed to realize the Indian spirit when presenting their knowledge. As India culture was a culture of believers and not atheists, each and every aspect of life here was filled with spiritual behaviour. No area of life can e presumed without the flavour of spirituality. In fact you can deny any scope for non-believers in this country. The author says: the belief in the constant evolution and involution of the world, in endless periods of recurrence, in the power of transmigration, and the acceptance of the intermingling of divine and human action in the world must have served to blunt the value placed upon, and the appreciation of, the importance of history. 'The author writes that the first historic Kavya preserved to us is deliberately built on the romantic model. The Harsacharita of Ban a Bhatta belongs to the middle of the seventh century A.D. Though he died before he could finish it yet he started it before Kadambari. Later historical works prefer the poetic form pure and simple. The Navasahasankacharita of Padmagupta or Pari mala, son of Mrigankagupta, is one of the earliest works of importance. More interesting is the Vikramankadevacharita of Bilhana written to celebrate the reign of the Chalukya Vikramaditya VI of Kalyana. Bilhana the author of the play Kamasundari and the Chaurapanchashika, was born in Kashmir, He studied the Vedas, grammar and poetics there, and left his native land to Kalyana. 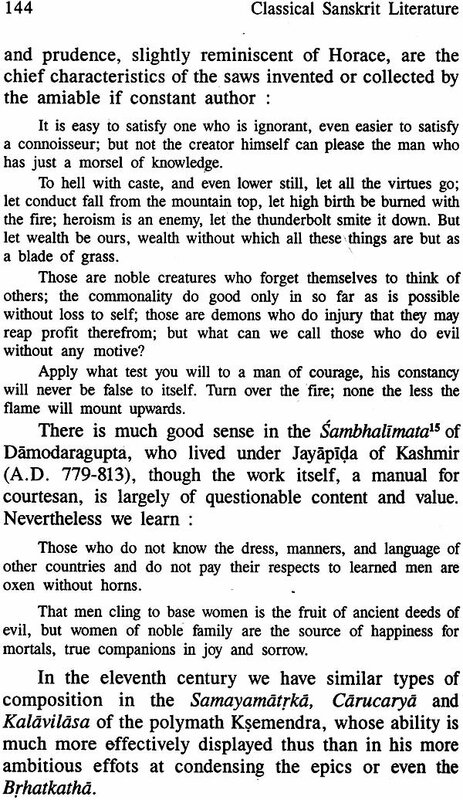 It is significant that the greatest historian who ever wrote in Sanskrit was also a native of Kashmir, He was Kalhana in the middle of the twelfth century A.D. The poet alone has the power to present to the world the facts in such a way as to reveal that he possesses genius and insight. Kalhana was can be called chronicler and he is a happy contrast to Jaina monk Hemchandra who has left among his voluminous works a Dvashravakavva. 20 cantos in Sanskrit and 8 in Prakrit celebrating his patron Kumarapala of Anhilvad.